The Social Station is a multi-use co-working space for creators and small businesses to start up and work towards a bright future. 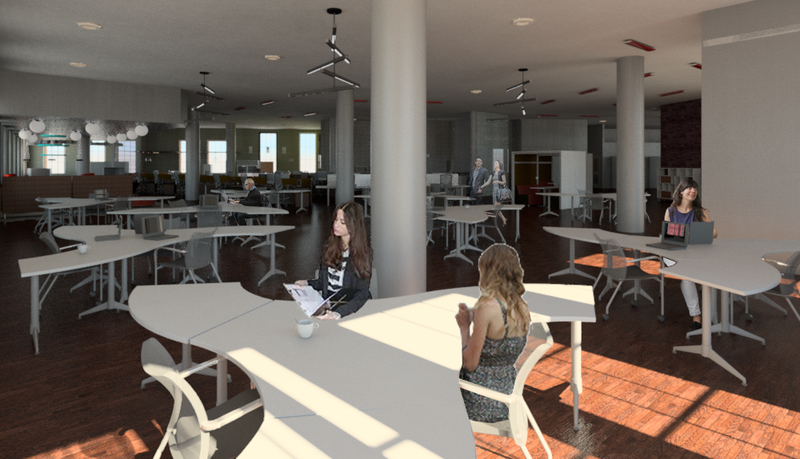 Communal lounge/heads down work spaces allow users to work in a different environment than their desk. Giving them privacy or simply a change of sceanery. Cafe and food wall. With an overhang the space becomes not only a place to eat but one where impromptu meetings can take place as well as socialization between businesses. This is a crucial spot to bounce ideas off one another. The yellow food wall accompanying the space uses a set of mechanical arms to grab the food specified by the user via touch screen and dispenses the item. It sparks movement and the gears on the front not only move but hint back to a time of inovation. Elevation of food wall with gears and touchscreen. The maker-space provides a unique opportunity for small businesses who cannot yet afford large machinery like plotters and laser-cutters a location to make their merchandise. It provides the users with skills they could not obtain easily elseware. The ceiling is a custom wave of cylindrical acoustical pendants to block sounds from traveling and includes cylindical lights throughout. Heads-down quiet spaces with individual Cocoons allow for privacy and focus.